Today is the first day of Spring Break for us. Henrik doesn’t really know what that means, but he does understand that Rob is going to be home for more days in a row than usual. We have been wanting to make a trip up to the “Bike Riding Park” for a while. It is close to the end of North Portland and we are at the south end of SE. We woke this morning to the gift of a beautifully sunny morning and decided that today would be the day. In preparation for the trip to the Bike Riding Park I had bought a Groupon for Posie’s Cafe. We had been at Pizza Fino using a Groupon a couple weeks ago and I saw Posie’s across the street on our way home. I was in the middle of my no smell/no taste phase of my cold and missed out on the good food. Luckily, we had leftover pizza and I was well enough that I was able to enjoy it a couple days later. I remembered that I had read a good review of Posie’s and when their Groupon popped up a few days later I jumped on it. I paid $6 for the $13 Groupon. I love Groupons! It gives us the opportunity to enjoy a meal out every now and then at a great discount. We headed to Posie’s and picked out four pastries and Rob and I each had a small drip coffee and the total came to exactly $13. What luck! We sat at the bar and enjoyed the food. Henrik announced that it was the “best food I have had in my whole life” and the barista took him back to the kitchen to meet the baker. He complimented her and then we headed back to our table to finish up. We met a Weimaraner and an Austalian Sheppard on our way out who were parked at tree outside Posie’s. They were very friendly and got lots of pets from us. A couple doors down we discovered the new Kenton Library. I have never been to a new library before. The books were all new. It was unbelievable. The Multnomah County Library system limits each cardholder to 150 items at a time. I was almost at my limit and we would only be able to check out 7 items. I found 2 books, Rob got a DVD and Henrik maxed out the card with an additional 4 items and off we headed to the Bike Riding Park. We found the Bike Riding Park when were house sitting in North Portland just before we moved to Portland in 2008. We had just moved back to Spokane to sell our house after a year in Milwaukee, WI for Rob’s Montessori training. We spent nearly every day for two weeks driving around with our Realtor, Patrick Smith, in search of our future house. It was wicked hot during those two weeks and we searched out parks with big toys nearly every evening to give Henrik a chance to burn off some extra energy before bedtime. 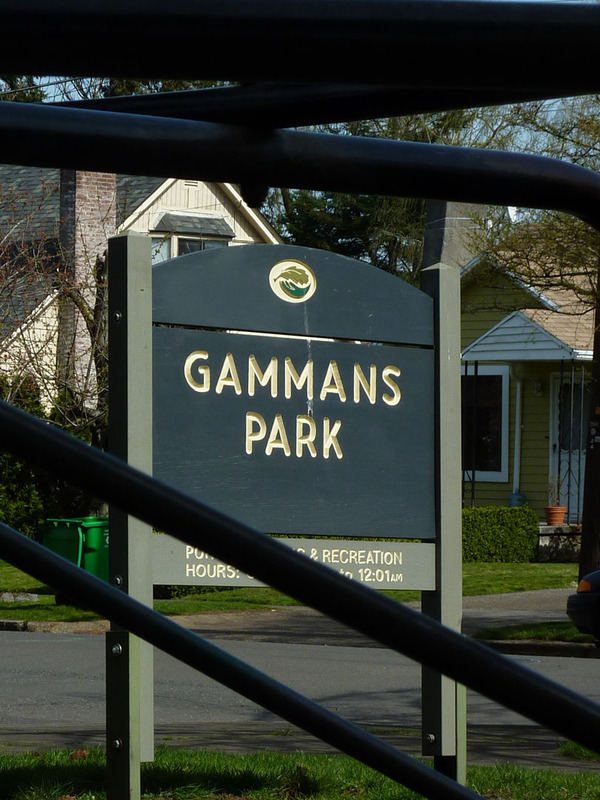 The Bike Riding Park is actually called Gammans Park. Henrik was 2 1/2 at the time and the big toys there were a little too advanced. But, we discovered a narrow paved path that runs through about a third of the south end of the park. We had no idea what the path was for, but Henrik had fun running along it. I later learned that the path was designed for tricycle races. 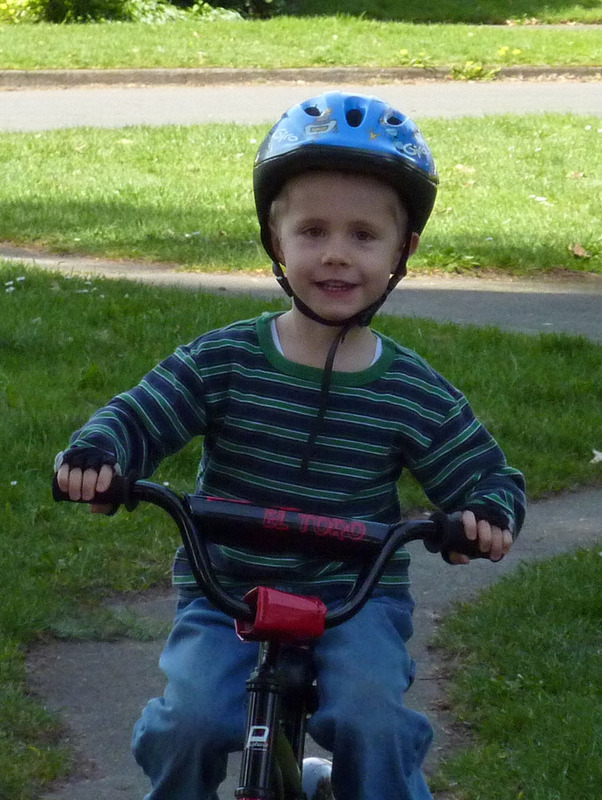 What fun that would have been…..
Henrik has been riding a two wheeler without training wheels for about month. Today was our first trip to the park since the switch from his balance bike to the two wheeler. He had a great time and we all enjoyed the beautiful weather. I was nice to get some natural Vitamin D after a pretty dreary winter. With the evenings staying lighter longer we are looking forward to more evening bike rides after dinner. The clouds moved in this afternoon and it is supposed to rain tomorrow. I am so glad we took the opportunity to get outside and have fun. All the riding wore Henrik out and he fell asleep during his quiet time late this afternoon. It is 11:30pm and he is still waiting to fall asleep. I am craving sleep right now more than Henrik…as usual. This entry was posted in Bike, Enjoy, Food, Local, Seasonal. Bookmark the permalink. This entry was posted in Bike, Enjoy, Food, Local, Seasonal, Uncategorized. Bookmark the permalink.